The two men competing to be the next governor of California met for their first (and, alas, probably only) one-on-one stand-off Monday. 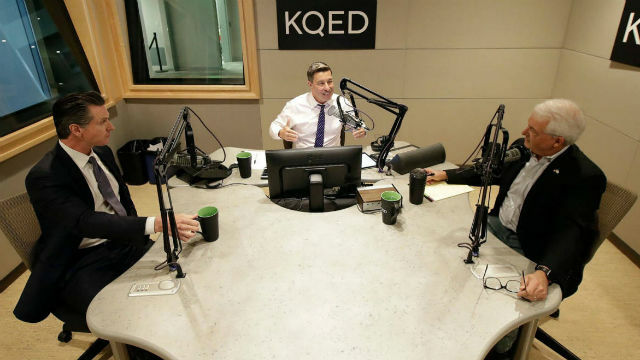 If you didn’t see it, that’s because the showdown—which was structured more as a spirited conversation than your standard dueling podiums-style debate—was on the radio, hosted by political reporter Scott Shafer, out of the San Francisco-based station KQED. And if you didn’t hear it, that’s because it was on a Monday. It’s a low-profile treatment for what may be the sole opportunity many voters have to evaluate the two candidates vying to become the next leader of the fifth largest economy on earth. But then again, few voters will have a difficult time distinguishing Lt. Gov. Gavin Newsom, a liberal Democrat and former mayor of San Francisco, from John Cox, a conservative Republican with the backing of President Trump. Cox disagreed, arguing that the focus needs to be on reducing the cost of adding new units by cutting state environmental regulations. The debate over housing quickly turned feisty as Newsom pointed to a number of his proposed solutions, including boosting the state’s low-income housing tax credit and allowing local governments to skim property tax revenue for affordable housing, and said that his opponent, Cox, offers only “an illusory strategy where he criticizes and identifies problems” but offers no substantive fixes. “I’ve evolved on those issues…just like Barack Obama,” said Cox. When asked about gun control, the candidate criticized the shift in the conversation towards “guns and all of these social issues,” arguing that he is not running for governor to change state law on those topics, but is instead focused on affordability. Cox was only too happy to talk about Proposition 6, the ballot measure that would repeal the recent increase in the state gas tax and other driver fees, which he has made a crux of his campaign. Cox argued that the state’s Democratic leadership “didn’t want to do the tough job” of eliminating wasteful spending and cut environmental regulations and raised taxes and fees instead. He insisted that under his leadership the state would be able to fund necessary road repairs without the new revenue. Cox ignored the reference to the president but said he would push for a repeal of California’s sanctuary state law. “If somebody is here illegally and they’re engaged in criminal activities I think it’s up to public officials to kick them out,” he said. Similarly, the two candidates also offered different views on the state’s recent criminal justice reforms, including the recent elimination of cash bail. And while Newsom celebrated the state’s climate change policy, saying the state should play a “role not just nationally but internationally to lead,” Cox was more circumspect. He agreed that the planet was warming and that human activity “may very well” be partially to blame, but he questioned whether the benefit of dramatically cutting emissions across the state was worth the cost to electricity ratepayers and drivers. That this year’s governor’s race will only feature one debate during the general election (there was a handful before the June primary) is unusual by historical standards. But it likely represents the new normal. As the LA Times reported yesterday, no race for governor or U.S. Senate has featured more than one post-primary debate since 2012. That may be a consequence of the growing political polarization of the state. Cox’s strategy during the debate mirrors the one he has employed for months on the campaign trail. He has tried to saddle Newsom with responsibility for California’s high gas taxes, it’s high poverty rate, housing costs and every other economic woe facing the state. As a social conservative who opposes abortion, Cox has largely steered clear of those issues. There’s a poetic irony that Newsom should be held responsible for so many of the state’s problems, given that he has occasionally griped that the post of lieutenant governor offers little in the way of actual responsibility. But as a Bay Area Democrat, Newsom certainly represents more of a continuation of current policy than Cox. For his part, Newsom also took a familiar tact in the debate this morning, arguing that Cox was “in lockstep with Trump and Trumpism.” To hear Newsom tell it, Cox is the president’s Midwestern alter-ego: a millionaire outsider with no political experience and ideas that are both unrealistic and unacceptable to most Californians. According to a recent poll from the Public Policy Institute of California, Newsom’s strategy appears more likely to succeed—and not just because he’s a Democrat in a blue state. Among likely voters, 61 percent disapprove of the way the Trump is handling the job. Meanwhile, by a slim 50-to-47 margin, more voters than not believe that California is headed in the right direction. As the frontrunner in a blue state, Newsom could be seen to have little to gain from more frequent, visible debates. In the newest Target Book Insider Track Survey, which asks consultants, lobbyists and other political players in California politics from both sides of the aisle, 37 percent of respondents said Newsom shouldn’t bother with debates because there’s no upside for him, only the risk of a downside. But 63 percent said he should debate—either because it would be a needed endorsement of the American political process (30 percent) or politically smart (8 percent) or both (25 percent.